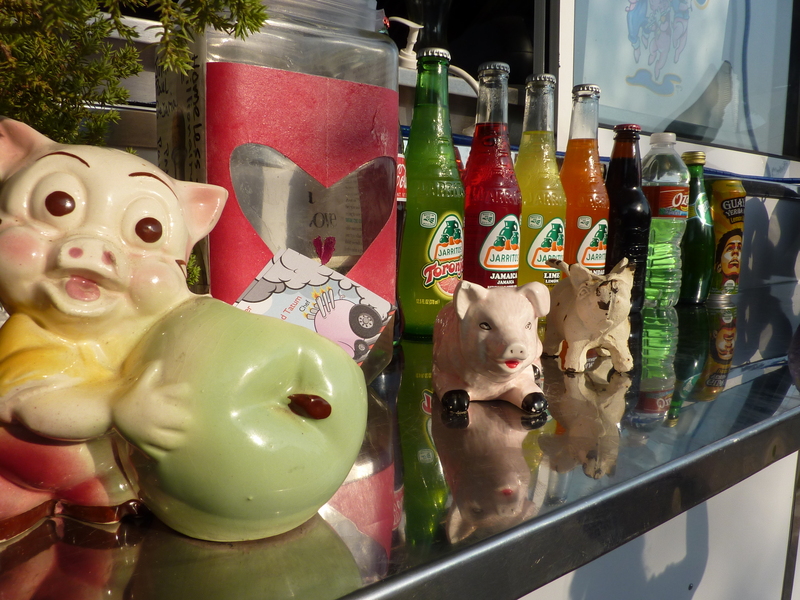 Just want to let you know that I’ve made a new guide on Foodspotting for Austin. It’s called Best Food By UT. It’s open for anyone to add or vote and it’s just a list of places that I would recommend around campus. I also picked foods that I personally like to eat at the place or something that seems to keep people coming back to that restaurant. There is also a badge available to earn if you are able to spot 5/6 items that are on the list. The badge: a half chocolate-dipped Texas-shaped cookie, yum! Feel free to add onto the list and it’ll look great with pictures finally on there! You have the address so no excuse not to visit! 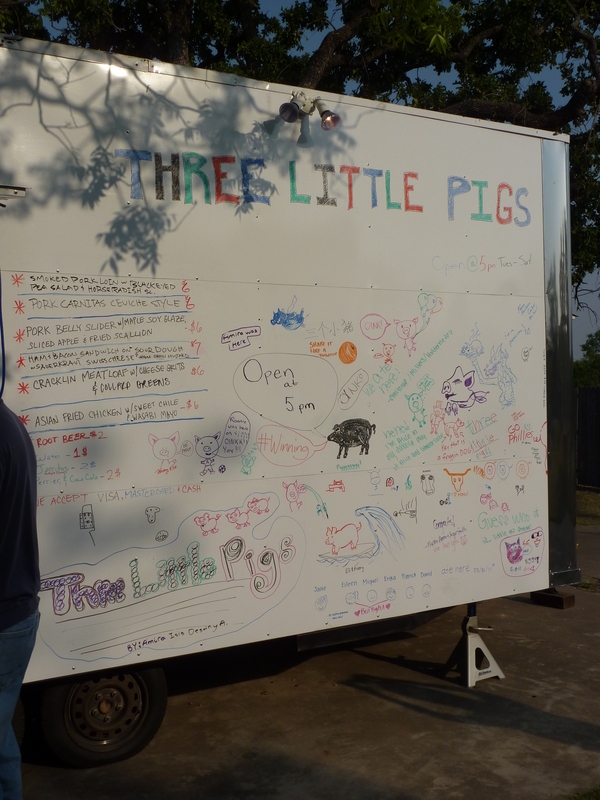 Three Little Pigs is a new trailer that’s opened up on the East side of Austin near campus, a little SE of Brackenridge hospital. It’s only been open a couple of months, but is quickly turning into a popular favorite with people like the owner of Jalopy Rotisserie trailer. It is run by professional chef Raymond Tatum who has finally opened his own little establishment. 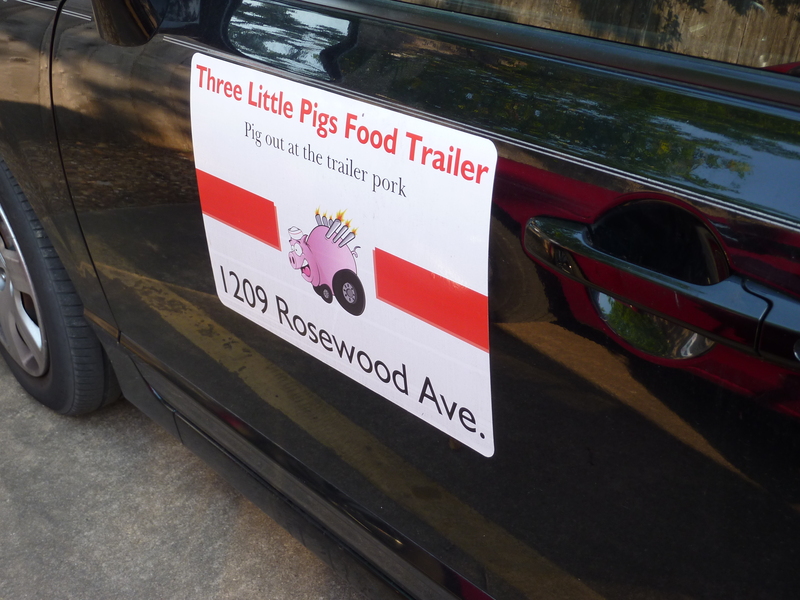 Three Little Pigs trailer is a tiny trailer with a white board side that will be recognized by its Three Little Pigs sign underneath East End Wines (see picture below). The basis of the menu is pork (as you can tell from the name) and it seems to be especially pork belly. 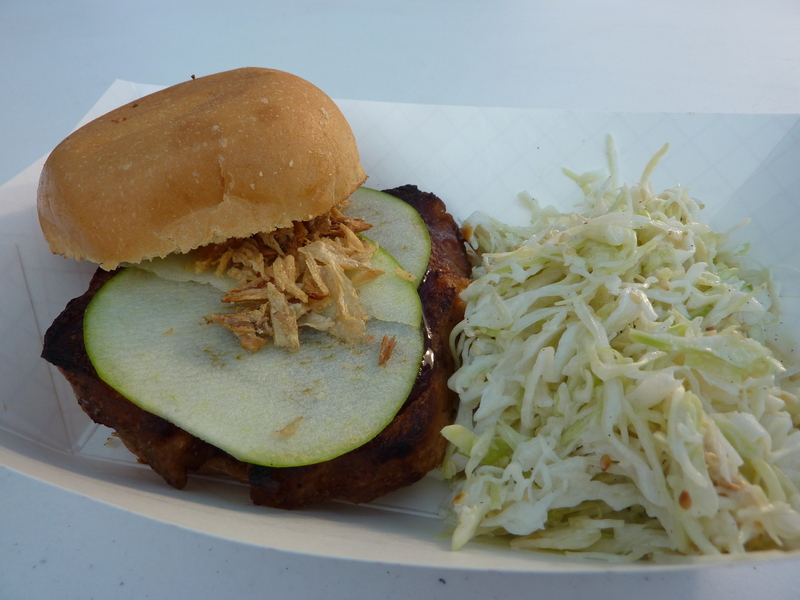 The pork belly slider is a popular favorite on Yelp. However, the menu changes daily and should probably be checked on its website. 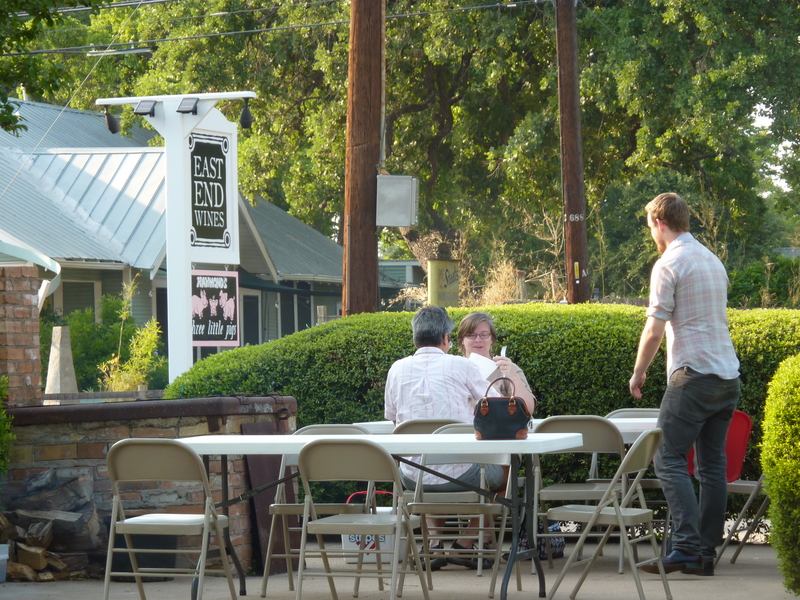 They also have a Facebook page that is awesome in giving updates about the trailer as well as supporting eateries like East End Wines and Pie Fixes Everything. Only open for dinner, check out the place and eat well! I personally ordered the pork belly slider. After hearing about it so much on Yelp, I figured it was something I had to try. The pork belly was nice and crispy and very thick slices. The bread was properly crisp on the outside, but soft on the inside. What really made the sandwich, though, was the maple soy glaze. It was a perfect addition of sweetness to the savoriness of the pork belly. The thin apple slice and fried scallions were good and added flavor, but I’m afraid were not enough to make much of an impact. I could have used a thicker apple slice. The sides with the pork belly seem to vary and I ended up with their unique slaw with sesame seeds. The slaw as not overwhelmed by mayonnaise and that was a definite plus. However, the sesame seeds seemed a little weird. It did give added flavor, but it was a strange flavor that I didn’t personally like and I’m sorry I can’t explain why. Your tastes may vary though. Overall, I enjoyed the pork belly slider a lot and would be happy to come back and try the other ideas the chef can come up with. We also had the smoked pork loin with black-eyed pea salad and horseradish sauce. It was good, but not great I guess you could say. However, our expert trailer food friend liked it enough to say he was excited to come back and try even more variations that the trailer has to offer. The people are very nice, helping out with menu decisions and keeping their tables clean. When a woman came up to ask for paper towels to clean a dirty spot on the tables, they offered to come out and clean the table for her. Along with this, you order at the trailer and they bring your food to you on a tray with napkins and forks. 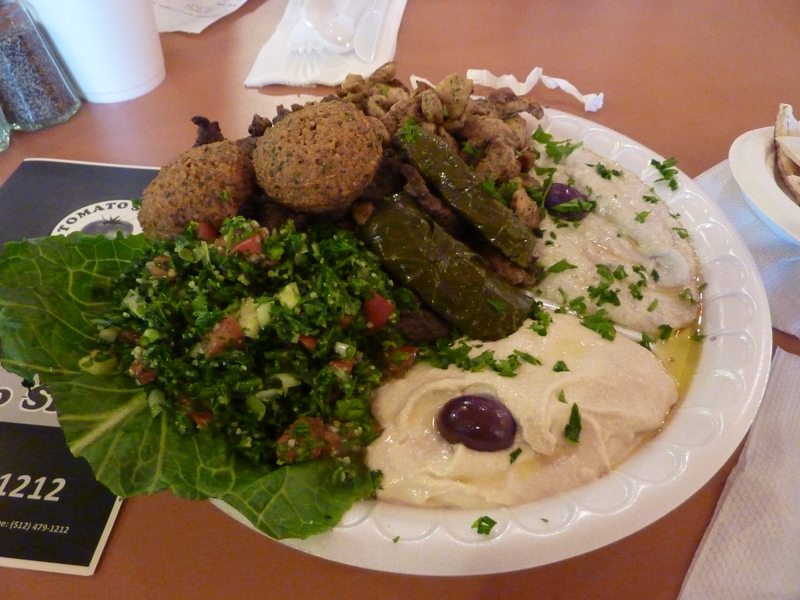 Overall, the trailer is a nice new place to check out some good food for a reasonable price (about $6 per meal). The food serving’s a little on the small side so you might want to think about ordering a dessert somewhere. Or splitting dishes with friends. Rating: 😛 😛 😛 😛 for varieties of pork dishes, rotating menu and definitely needing more tables for the future (only 3!). Sometimes you just have to get away from the cafeteria and eat something “normal.” On those days when eating out isn’t an option, why not try a simple recipe to cook in the convenience of your dorm room? How am I to do that you ask? All I’ve got is a mini-fridge, a microwave, and junk food. Well, that may be true, but I’m here to tell you of some sites and books you can check out to improve your college food life. A great article on general guidelines to use when you’re cooking in a dorm is the article Campus Chow written by Kristin Stewart from Epicurious.com. If you’re a cooking foodie, you’ve felt those pangs of coming from a well-stocked kitchen to a tiny, barely-working dorm microwave. The best advice that is given is that one should use simple and quick recipes so that time isn’t wasted slaving over the microwave trying to create a decent meal. Fudge is easy, microwaveable eggs are easy, grilled cheese sandwich is a no-go (but learn how to make a grilled sandwich in the dorm at the bottom). Rating: 😛 😛 😛 for giving good guidelines on what recipes are best for being foodie. 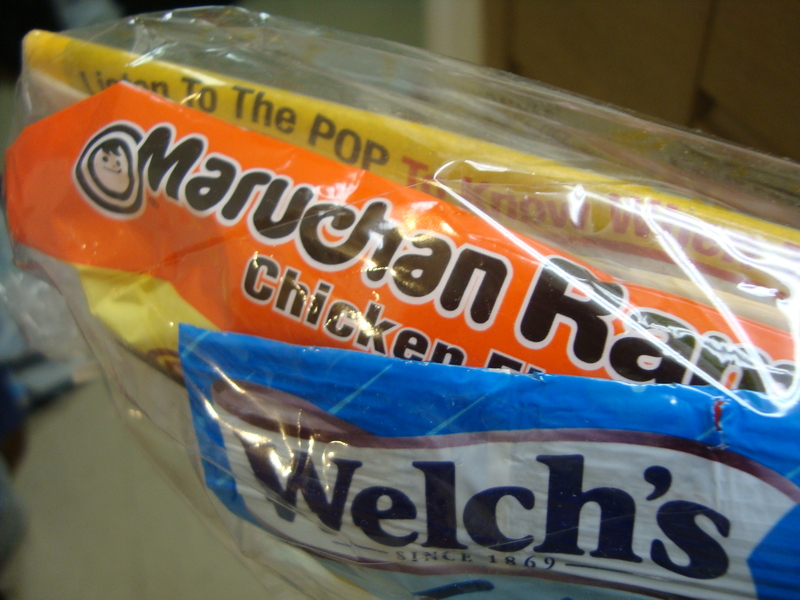 I can’t forget that classic college staple: ramen. After a while, you’re going to get bored having the same boring cup ramen. What do you do but try out new recipes with them? 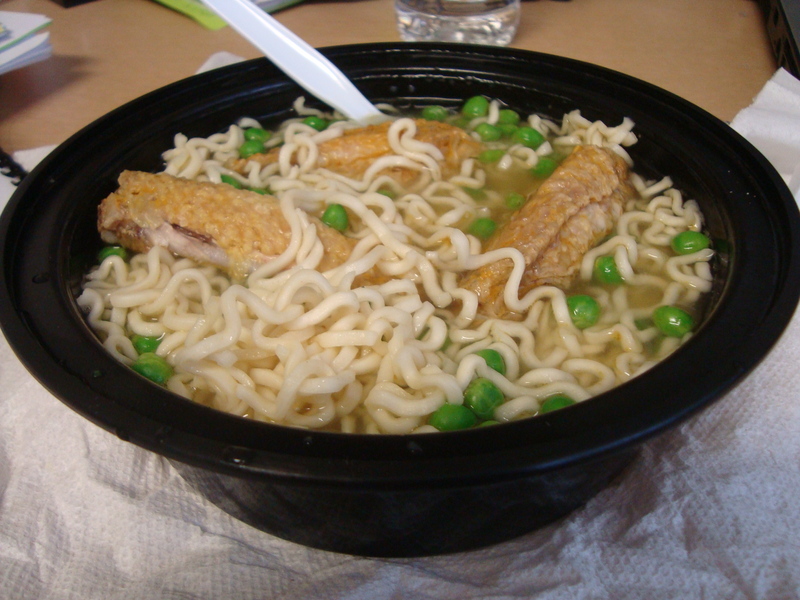 Here is the “official” ramen recipe site that I like to use when I’m bored eating ramen as is. Some of the crazier concoctions I’ve seen are the use of potato chips for crunch and even whipped cream! Yeah, some unique ideas are abound, but have fun trying out some new recipes and being a ramen foodie! Rating: 😛 😛 😛 ½ for being THE site I go to for new ramen recipes. For a fun and unique blog I found check out this site here. A college blog kind of like mine, but with recipes that look quite yummy and very easy to make. Rating: 😛 😛 😛 ½ for really embracing the idea of eating in college and having easy to follow recipes. In the book department, you can always check out Amazon.com, Borders or Barnes & Noble to see the many cookbooks available for college/dorm cooking. Sometimes they assume you have more than a microwave, but generally they are a good beginner’s guide to how to cook tasty recipes in your very own dorm room. The cookbooks are also branching out to reach underrepresented foodies like the vegetarians and those who want to be healthy. Definitely one book I would recommend to anyone going off on their own is Where’s Mom Now That I Need Her? : Surviving Away from Home by Betty Rae Frandsen, Kathryn J. Fransen, and Kent P. Fransen. Though I do not personally have the book, it is an amazing book to help with the transition to college or to having to run a household in general. Rating: 😛 😛 😛 😛 ½ for being that voice in your head letting you know how to make things just right. Finally, I can’t end a college cooking blog without talking about how to make a grilled cheese sandwich with your friendly neighborhood iron. That’s right, an iron. The best way is to look it up on the internet, but I’ll give you the basic rundown. 1. Butter outside of bread. 2. Put cheese and any optional grilling layers inside like ham. 3. Wrap up whole sandwich in aluminum foil. 4. Put on surface that will not burn. 5. Turn off any steam option on iron, and then warm it up. 6. Put hot iron on top of foil wrapping the sandwich and leave for about 30 seconds. Obviously, if anything like burning smells or smoke comes up, please take off the iron. 7. After the 30 seconds, check on toastiness of bread and almost-melted quality of cheese. Continue with 20 second intervals until reaches level of toastiness and meltiness as desired. 8. Flip sandwich with foil over and repeat steps 6-7, but until cheese is fully melted and bread toastiness has reached desired level. 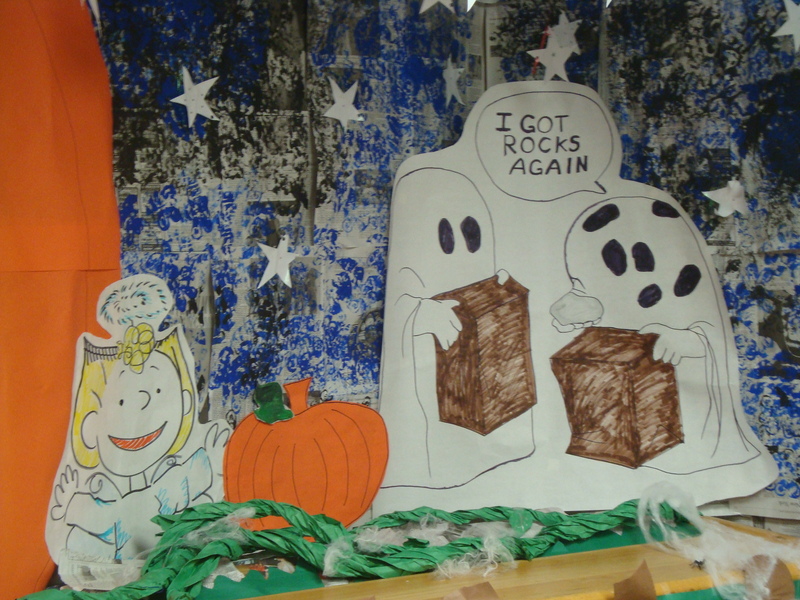 Trick or Treat, The Final Week! Here's hoping for only candy this Halloween! Seems like I won’t get in a post before the month ends so I’d like to sum up the posts that have been most popular this month. Thank you all for reading the blog and hope to see you in November! PREVIEW: Red Mango! It actually got the most hits when first posted and is still one of the more popular posts of the month. It was twittered and connects to my follow-up post where I actually went to Red Mango and tried out their tasty yogurt. Red Mango is definitely one of the yogurt places you have to try before you deem who is most worthy of your cash for yogurt in Austin. It’s tough competition out there, but Red Mango is one of the forerunners of fro-yo and should be a good match. You get bang for your buck! REVIEW: Arpeggio Grill, The Rotating Restaurant! 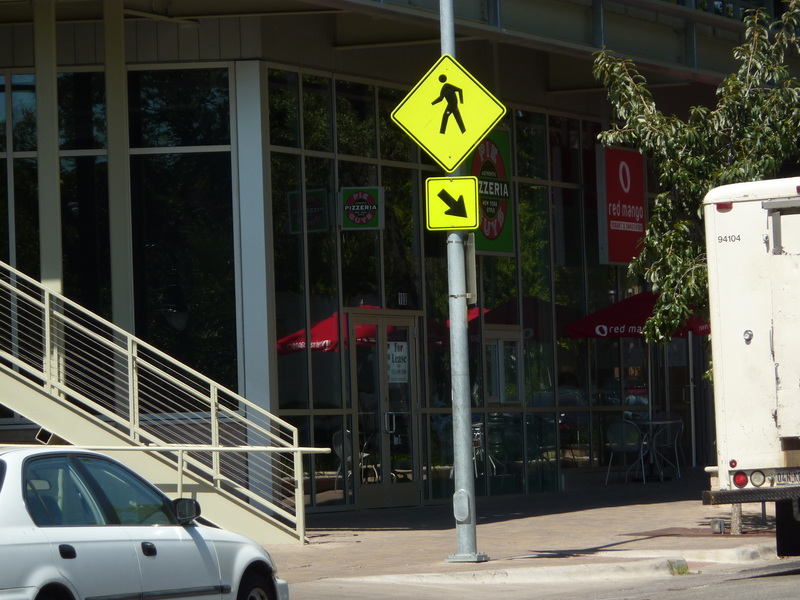 I guess there really isn’t a lot out there about the satellite location that recently opened up on the Drag by campus. Arpeggio Grill is located in the infamous storefront that has seen 3 restaurants in the last 3 years. Will Arpeggio outlast them? From the way things have been going and the direction of the management, I believe so. Please stop by if you’re in the mood for Mediterranean and leftovers to boot! Nope, we ain't talking about you today, sushi. Kimbap vs. Sushi! This was one of my favorite posts to write and really something I contemplate when I’m thinking about Asian food to eat. I mean, no one’s really given me a straight up answer what the difference is and perhaps there really isn’t one. 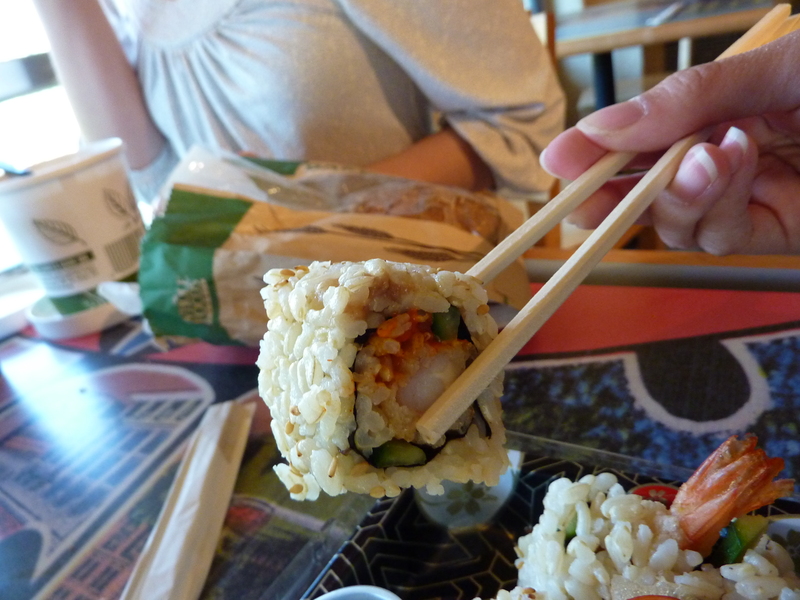 After all, kimbap is kind of a derivative of sushi. 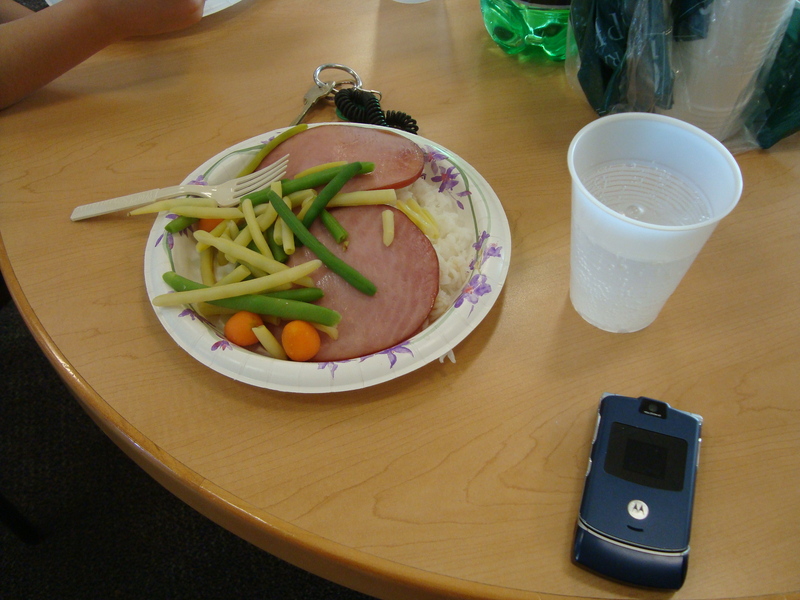 However, each has progressed and catered to far different cuisine and taste buds and each are popular goodies to eat. Please check it out and tell me what you think the difference is between kimbap and sushi! Blog Action Day 2010: Water!!! Every year, Blog Action Day is a day where blogs around the world take a little time to reflect on what we can do to make a difference in the world. This year, the focus was on water and the extreme difficulties people face without accessible clean water. It’s so easy to help out and the results are far-reaching. Fresh water is a resource everyone should have access to and making a difference can be made by anyone, especially college students. Congratulations to you blog posts for capturing interest and thank you all for reading the posts! Hope to see you around the blog and please let me know if there are any food topics, places or products you’d like me to focus on next month. Have a Happy Halloween! Annie Chun is becoming a well-known brand at organic food stores, presenting microwaveable Asian dishes to be made at home that aren’t full of the pesky and questionable food additives often added. A big problem with Asian food is the addition of MSG, which Annie Chun proudly claims is NOT in the food. Eco-friendly and with great variety, it’s no wonder Annie Chun’s All Natural Asian Cuisine has become popular. 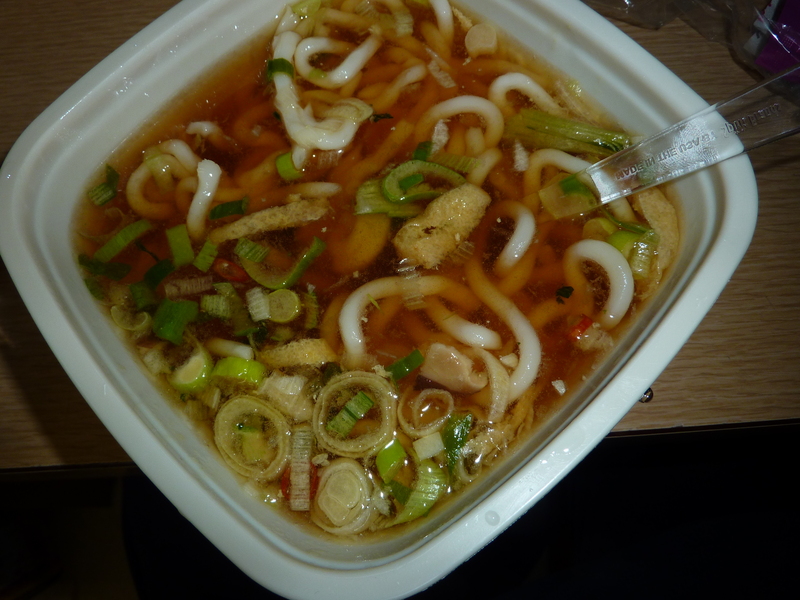 I have tried some previous creations of Annie Chun’s such as the Thai noodles and the miso soup. However, I have been unimpressed in taste and texture. Perhaps I don’t cook it quite right since I am pretty bad at measuring by sight, but the food seems to run sour. I like sour food, but this seemed so sour that it overpowered the dish. 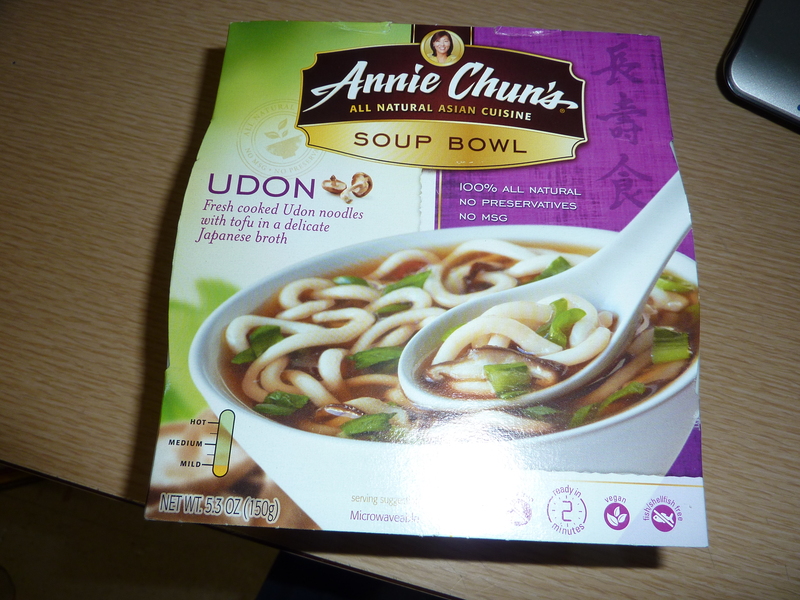 After church, I decided to try the Udon noodle version and see how that would fare. Admittedly, sour could be an added component, but I was betting that Udon should be of a more sweet and savory (or umami) taste. After duly following the instructions, I proceeded to eat my bowl of soup for dinner with some added Vienna sausages. Overall, the noodles were not as soft as I liked, but then I did not soak with the hottest water. I just used the hot water that came out of the tap. The toppings were plentiful and flavorful (with a little pepper for spice), but there seems to be a distinct lack of mushrooms as claimed to be in the dish. Little bits are chopped up, but they are few and far between. If there were more mushrooms, this dish would have been better. The broth is decent with the claimed umami taste, but not great. There is a hint of sourness, but that may just be from the toppings that are in the dish and it in no way takes away from the dish. Why are you always so much sodium? 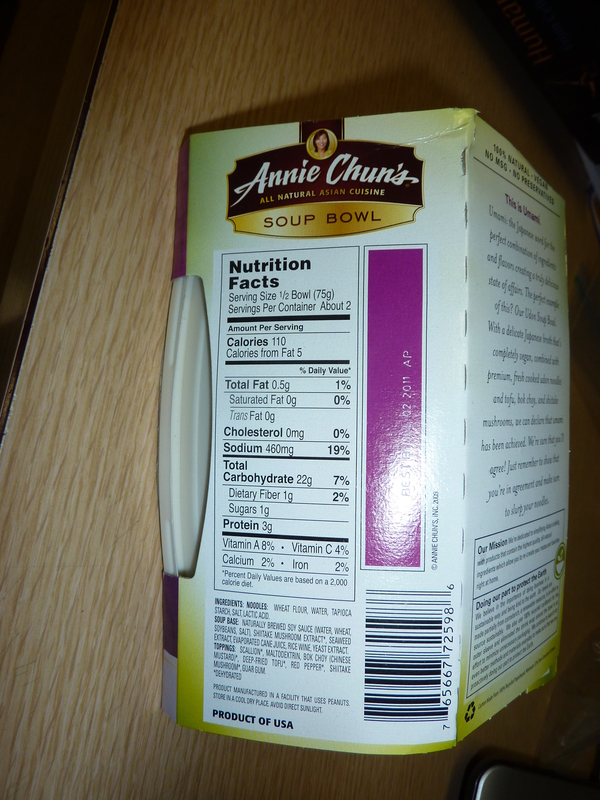 A little too much sodium, not the best tasting ever, I am still not impressed by Annie Chun’s All Natural Cuisine, but I do admire her attempts at making healthy organic Asian food for the regular consumer. I cannot claim to be an expert, but I know chop fooey when I see it. Blog Action Day is coming up, which is a day that blogs around the world take the time to post on an important and worldwide issue. This year’s topic is about water. 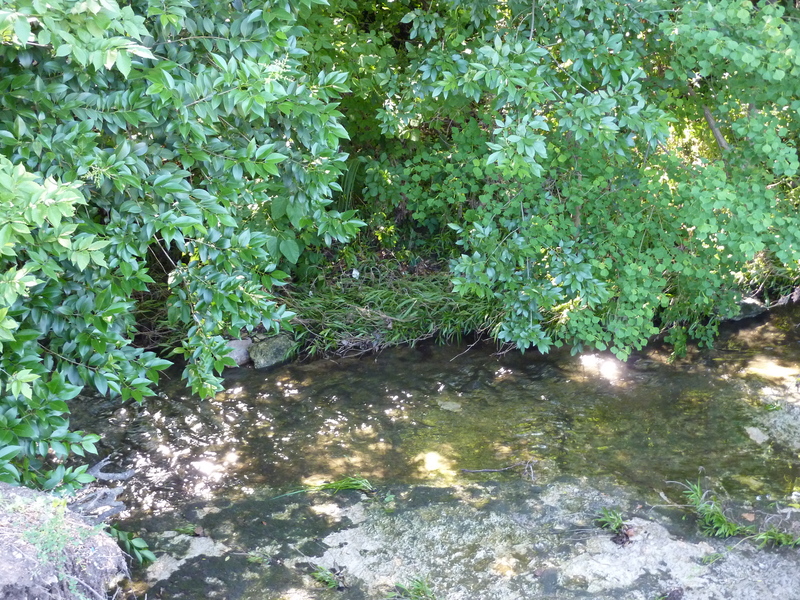 Though it is a basic necessity, there are still major problems trying to get clean water. The lack of resource can lead to all sorts of problems for people’s health, creating wars, even leading to mortalities. On October 15, I will personally be blogging on the importance of water and its connection with food and how we can make a difference. The importance of clean and available water for everyone is especially near and dear to my heart since that is one of the first charities I became more seriously involved in back in high school and I believe everyone has the right to clean water. Please check out the post and keep on coming back because there are a lot more food posts to come such as gelato, yogurt, and Potbelly’s! I just want to create a shout-out to UTPD, APD, and all the other law enforcement organizations that came to the aid of UT campus, September 28. They did an amazing job in taking the event seriously and doing their best to keep everyone safe on campus. I am also proud of the UT community for doing their best to keep each other safe during that time through phone calls, FB, Twitter, and any other way we could communicate with each other. I pray for the young man who lost his life, that he may find peace, and that his family and friends will find comfort. It’s difficult to feel like writing about food is appropriate after such an event so this post will stand alone, in tribute to the attentive response of the UT community to the events of Tuesday. I pray that we continue to act as a community to recover from the events and that we are reminded, as the Daily Texan has highlighted, to let no one fall through the cracks.